At its Windows 10 Hardware Press Conference held at 10am today in New York Microsoft also announced its first ever laptop, the Surface Book. It features a 13.5-inch PixelSense detachable display screen which at 267 DPI gives a super quality 6 million pixels (3000 x 2000) resolution, optically bonded, color, contrast and clarity. The touch screen display is 7.7mm thick and weighs just 1.6 pounds. The screen opens up in a dynamic fulcrum hinge and it's also easily detached turning this powerful laptop into a convenient digital clipboard. The Surface Book also features a backlit keyboard and a glass trackpad all packaged in a magnesium body. In its announcement Microsoft said that the Surface Book is the ultimate laptop doing to the laptop what the Surface Pro did to the tablet. 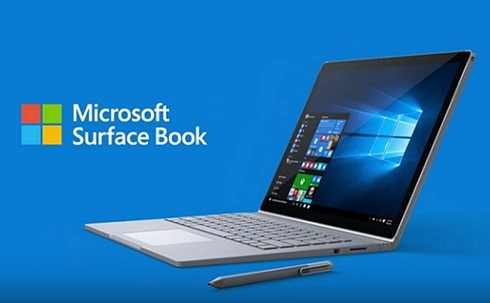 With the latest generation (6th generation) Intel Core i7 Processor, NVIDIA GeForce GPU and High-speed GDDR5 memory, Microsoft has said that the Surface Book will deliver ultimate performance and is the fastest 13-inch laptop ever made!!! How does it the Surface Book compare? According to Microsoft, the Surface Book outperforms any competitor in its class and is two times more powerful and faster than the MacBook Pro!! A new Surface Pro 4 cover which is lighter, thinner and sturdier and also works with the Surface Pro 3. Prices for the Microsoft Surface Book start at $1499 (128 GB Intel Core i5 with 8 GB RAM) and $2,699 at the top end (512 GB Intel Core i7 with 16 GB RAM and NVIDIA GeForce Graphics Processor). Like the Surface Pro 4, you can pre-order your Surface Book right now but the devices won't be available until 26 October. The Microsoft Surface Book is certainly the perfect replacement for those old and tierd laptop computers like my luggable Dell Laptop. More than just a tablet, with its detachable screen it's the ultimate 2-in-1 capable of running powerful desktop applications under the latest Windows 10 Operating System.